The &ldquo;Lucky Star&rdquo; OVA is made up of several short stories or chapters. A coherent plot or over spanning arc is hence not present, but this is not uncommon for &ldquo;Lucky Star&rdquo; and the different short stories ensure the OVA will have something enjoyable for everyone. From a slice of life story, to a full blown comedy or parody story to a heart warming tale, the OVA touches upon all of the types that were featured in the series. Being all about Konata, Kagami, Tsukasa and Miyuki, it's a bit of a shame the other characters were featured less. Yutaka, Minami, Patricia and Tamura only appear in the first story, Misao, Ayano and Nanako sensei appear briefly in the other tales. But this is normal given the time restraints. The first story was centred around Minami's dog Jerry and how he encounters everyone throughout his day. A nice slice of life tale to start the OVA with it also held some great laughs. It was followed by a story showing Konata and Nanako-sensei playing an mmorpg together with Kagami and Tsukasa, told in game which lent itself to some 3D CG visuals and funny mmorpg humour. A dream sequence story brought us Konata dressed in &ldquo;The Melancholy Of Suzumiya Haruhi&rdquo; Yuki's sorceress outfit taking Kagami who was transformed into Volcaloid's Hatsune Miku's outfit -complete with leek- out on an evening filled with magic. Next was a volleyball match with the Hiiragi sisters on opposing teams which turned out to be a more heart warming story, one couldn't help but root for Tsukasa. Then followed a school camp tale told by Miyuki to her mother about how she and her friends erred from the correct path while heading to their camp and ended up wandering around the forest until late at night. The closing scenes were a more psychedelic dreamlike scene which did not appeal to me that much alas as I understood little of the humour in it. The ending credits feature a live action clip of Akira Kogami's seiyuu Ai Nonaka and Minoru Shiraishi, which I found enjoyable a lot funnier than the live action closing scenes featured in the series. It was uncanny how at times Ai Nonaka's performance and facial expressions were so spot on, one would almost think the Akira persona is based on her. Minoru Shiraishi as always is a hoot, that guy is so silly! Like all of Kyoto Animation's productions, the animation was good, but not especially better than the series itself as the typical and somewhat more simple visual style of &ldquo;Lucky Star&rdquo; does not lend itself to the same visual feats as other series Kyoto Animation has animated are treated to. The subdued color palette and character appearances reinforce this impression. However they did use the OVA to experiment more with different animation types and scene effects for &ldquo;Lucky Star&rdquo;, as is apparent in the psychedelic dream scene or the mmorpg in game scenes. The soundtrack was good and featured tunes from the television series, however the series' opening track &ldquo;Motteke! Sailor fuku&rdquo; was omitted entirely. The &ldquo;Lucky Star&rdquo; OVA was terrific, full of laughs and a must for &ldquo;Lucky Star&rdquo; fans, it has the exact same atmosphere as the series so it doesn't feel particularly special but you will feel as if watching the next episode, which is fine with me as the &ldquo;Lucky Star&rdquo; series was awesome. The Lucky Star OVA was very well done. It brings fans back to the series of lucky star and includes all the characters that you have gotten to know and love... excluding a few characters... Lucky Star generally never has a real story to it but the small episodes in it seemed to flow very nicely. Since there really is no true story, I had to rate the story as a 7/10. To people who are unfamiliar with Lucky Star, watching the OVA might make you confused because you don't know what is going on. However, if you watched the series then the OVA should make perfect sense to you. All the stories were fairly good but near the end, with the pet store, it was funny but it could have been better. Personally it was not my cup of tea but it still had its moments. The art is very well done as usual. The characters seem to look the same and the art style had not changed since the series. It is pleasent to look at and it doesn't have extremely and unnecessary shiny characters. The 2nd story in the OVA is very well done as that is what many MMOs look like. Sound: The sound was the same, nothing really special changed from the series to the OVA. One can expect the same quality as they did in the series. Characters: It is very nice to see most of the characters again. It is even better to still see them with their original personalities. Kagami is still her usual self and Konata is still a crazy otaku. Enjoyment: You can expect that this OVA is done just as well as the series. If you didn't like the series, you will not enjoy the OVA. If you did like the series, you might think the OVA is a bit of a disapointment. However, it is still worth the 45 minutes to watch. 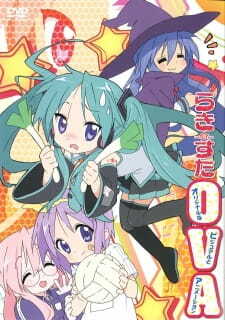 For an OVA that is suppose to be for Lucky Star... it wasn't very good. The ova consists of a couple of mini-episodes that were suppose to be for the amusement of fans. Where was that amusement, might I ask. The first story that began had more to do with the dog than with the characters themselves. Basically, it was more of the dog sleeping, with a few glimpses and actions from the characters. Not the best to start out with. Shortly after, we have an RPG game.. and though it is nice to see some 3-D type action.. it was rather annoying that all they did was talk, and repeat in battle sequences. 'sighs' Really I was starting to loose my interest. Finally, we get something entertaining in the 3rd mini-episode. The Cinderella type story, with Konata as the fairy god mother, or should I say god witch. Here is where I can see why some fans would want to watch the OVA for. It was very amusing to see Konata up to her silly but cool and layed back type antics. The wrestling (though I am not a fan) was rather interesting, especially seeing as it took the form of the ball in the story. The ending was also hilarious too. Then we have the Vollyball game.. not as good as the Cinderella type story, but almost... Sisters against each other, along with two other friends (yes.. Konata included). I must say it was fun to watch them go at one another in attempt to be each other, and with an interesting outcome.. 'chuckles' So amusing. Then there was some strange man trying to sell Konata's RPG character some items... and then it skipped to the camping story. And when my enjoyment rouse... it fell. The group is lost within the woods, thanks to Konata, and trying to find their way to the camp grounds. All they really did was walk around and talk.. which was pretty boring half the time. I think the only enjoyment I got was watching Konata proclaim they were going to die... Finally we have the sensei's house which was very short and... very confusing. I think that is the only word I have for that.. that it was very confusing, and yet ridiculous to the point it forced a laugh out of you. My rating for the story a five. The animation in Lucky Star, like always it was very good, but it is different this time comparing it with the RPG 3-D effects. Something about seeing the characters in 3-D sort of rubbed me the wrong way. Don't get me wrong, it is nice to see them come to life in 3-D instead of remaining in 2-D, but I just.. I don't know. I think it had something to do with the gaming effects... Something about them could of used a bit more something. So the art work is seven. Okay, boredom sort of brings your view of the characters down a couple of notches so do not be mad at me. The characters were good.. they brought a nice ingrediants to the min-shows, even if the show was boring...'twitch' They were kept well in character in my opinion. I don't have much to say other than that.. and Konata was most certainly amusing in her witch costume. My enjoyment is a four. Simple as that.. I didn't really find my enjoyment rising in this. It fell a great deal with the first two mini-shows, but rouse by the 3rd and 4rth shows, but dropped again shortly after. Really, it wasn't very good as I had hoped. 'sighs' It did give me a good laugh now and again, so it deserves a four for descent. In other words it wasn't all bad. Overall, I think it was a pretty fair OVA, considering that it gave us fans something more from the series, and showed what they would look like in a more 3-D type nature. It also provided a nice sense of humor, and show a good deal of care for ones pet.. Yeah, it may have been boring, but it wasn't all that bad. I think a six is a fair overall rating for it. Well the thing about this review is it's directly compared to the other series, favorably or unfavorably. And after just writing a Lucky Star review, I thought it was only right that I write a Lucky Star OVA review. In fact, I only got up the energy to write a Lucky Star review to the community. So, now that I've filled out the preface, it's time to get to the individual qualities of the short movie. Or actually, just medium as an OVA. Well how does one comment on one story, that's slice of life episodic comedy? Well, you rate it on being an episodic, slice of life comedy. This one doesn't quite pace as the other one did. And has quite a bit of cool down and then short spurts of comedy. It's not so chatty and eventful as the main series. In this way it does make it feel a bit more like a movie. But at the same time, it doesn't do what it does quite well as it did with the main series. You expect more out of it than you get. It moves slow and uneventful, and ends before you know it. Well at least in it's favor, it ends long before you want it to end. It's the same great artwork as before. And there's no change at all. So there's really nothing to say about this. It's the iconic moe art style we know and love Lucky Star for. Well you know...I didn't even notice the sound too much this time around. It doesn't have that memorable opening song that I remember. And it all seemed sort of quiet. Too quiet at times. It didn't really have to have all the music though. And the character voices were as cute as ever. I think I have to commend them for spending the time they did on characters like Patricia Martin. But overall, it felt like when it was supposed to be a party, that it was an empty party. I think this part...this...OVA..was lacking in some of the character charm and development that Lucky Star often had. In the case with everything with this OVA, it wasn't bad, but it wasn't as good. Even if an OVA isn't as good, it's a Lucky Star OVA. Meaning we'll love it. Seriously, how long were we starved for this? Too long. I went through every second of this thinking how I couldn't believe I was getting to watch more Lucky Star and fearful of every minute I drew closer to the end. It might have not been jam packed with the same about of fun as the main series, but it was still a lot of fun and well worth the watch. Overall, it was what the number 8 says. It was very good. And well worth the watch and very much needed, beyond needed. It was almost cruel how long we had to wait. But it wasn't every thing Lucky Star was. I think a person is better off watching Lucky Star the series first, and then watching this because they're still absolutely starved like I was for more. It may not be one hundred percent as good as the original, but it's still got the magic. I don't want anyone to think and to get the impression that because it doesn't shine just as hard as Lucky Star the TV series that it's not every bit a good and enjoyable anime. It's a quality watch and I recommend it to anyone.